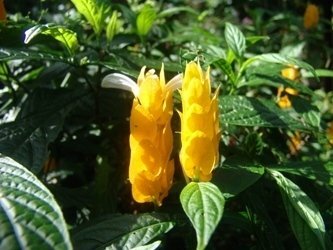 The Acanthaceae indeed provide us with a generous number of plants, it includes some 256 genera which add up to approximately 2500 different species, spread among herbs, shrubs, vines, essentially throughout warm temperate and tropical areas. 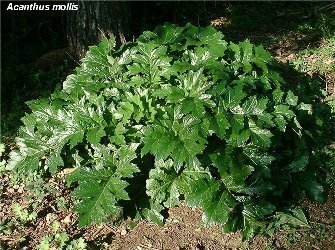 The family name comes from one of its genera, the Acanthus which numbers some 30 species originating from the Mediterranean, the most widely known being probably Acanthus mollis or oak-leafed bear's breeches. 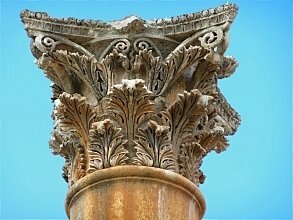 Acanthus leaves have been used as models for architectural decoration by the Greeks of the classical period and they adorn all Corinthian columns. Many plants of the family are grown in tropical gardens as they often produce colorful flowers, either due to the flowers themselves or to bright ornamental bracts, some display attractive foliage, variegated or colorful. As one may guess, such a huge family will require several articles even though we will not be able to meet the somewhat 2500 members it includes! Stems and branches are sometimes knotty and quite often covered by thin hairs; some carry spikes. The leaves are opposed-decussate (opposed means they face each other at the same level, decussate states that there are 90° of divergence between two consecutive leaf pairs). Those leaves are entire, with or without a petiole and may carry some cystoliths (minerals such as calcium carbonate crystals included in a cell) which can be quite conspicuous. Flowers can be born either on inflorescences as spikes or racemes or as solitary axillary flowers. Those flowers are bisexuals, usually large and colorful, often with bracteoles (small bracts). The fruits are capsules with two parts and they often burst open when mature (they are called dehiscent) and can eject the seeds at some distance, the characteristic ‘pop' sounds can easily be heard even at several meters away and the small but hard seed may transform itself in a painful projectile for the poor gardener's eye! The Acanthaceae family is quite close to the Scrophulariaceae but members of the last family lack cystoliths as well as bracts and bracteols, a common feature is the fact that stamens can be didynamous (four stamens out of which two are short and two are long). This large family originates from various parts of the world; Africa, Madagascar, Indo-Malaysia and Central America. There are five species endemic to the Mascareignes archipelago which will be only mentioned for record but not detailed; Barleria observatryx, Hypoestes serpens and Dicliptera falcata, all three from Mauritius; Hypoestes rodriguesiana and Hypoestes inconspicua both of which are from Rodrigues island. 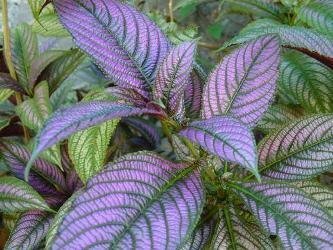 So let us now proceed to introducing some members of this fantastic family, starting by a stunning one, Strobilanthes dyerianus (one of the mere 250 species of the genus Strobilanthes, all from Asia) known as "Persian shield" in the U.S. 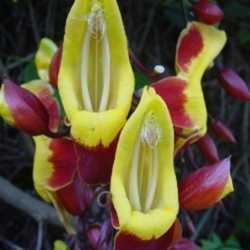 This one comes from Burma (also known as Myanmar) and grows as a bush up to two or three feet. Flowers are borne on short spikes and are rather inconspicuous compared to the amazing leaves, which will stop any visitors in their tracks. Those leaves have an ovate shape ending in a sharp though soft point and display a mix of silver, dark green and purple, the underneath being fully deep purple. The leaves are often of different size even when facing each other at a node, this feature is called ‘anisophyllia' and is common amongst the Acanthaceae family. The plant will not tolerate full sun which would soon ruin those distinctive leaves, so a semi shaded spot will suit it all right, with a loose and rich soil. It seldom produces seeds but cuttings are easy to root, a nice feature amongst most of the family. Next we will enjoy a more discreet plant though it also produces rather strange-looking flowers and is seen quite often in gardens of Reunion. Ruttya fruticosa (one of the only three species within the genus) comes from Eastern Africa and grows in shrub habit up to three or four feet, its long flexuous stems will arch downwards but may keep going upwards if they find a prop. Leaves are glossy with an embossed effect. The flowers are orange-red with a funny shiny black bubble-like appendage on the lower lip. As they come in small clusters of three or five they do have an effective decorative look. The plant can be left with its natural habit or pruned to fit in smaller gardens. 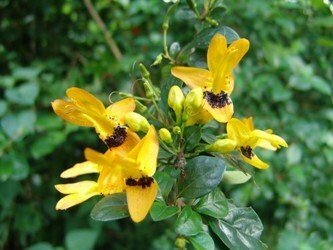 Ruttya fruticosa ‘Scholesei' is the very same plant except that the blooms are yellow and black. 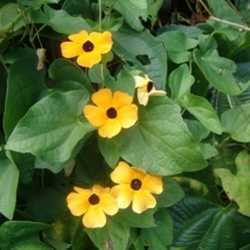 It will thrive in full sun, preferably in loose soil but is not fussy and extremely resistant to insects and diseases. As it is more subtropical than tropical it can be grown in cooler areas as it will grow back from the roots even if the aerial parts are killed by frost. You will have to slightly bend your neck to enjoy our next guest as it only reaches one or two feet, the ‘monkey-plant' is also called ‘trailing velvet-plant' and deserves its name (at least the second one, I still wonder where the monkey is here...). 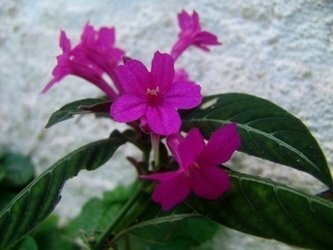 Ruellia makoyana- (one of the 150 species of Ruellia) comes from Brazil and is classified as sub-shrub because of its small size. 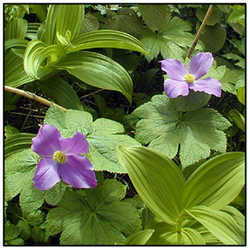 It is nonetheless an interesting plant for gardeners, useful for borders or as understory ornamentation. The flowers are small but a luminous shade of magenta and the leaves are also quite showy with a dark green above face enhanced by white veins while the underside is purple. It will prefer semi-shaded spots and a rather humid environment, full sun and dry wind would soon turn into an unsightly dried-up thing. Propagation is very easily done as the plant readily roots whenever a node touches the ground so plantlets with roots can be severed from the mother plant and moved elsewhere or potted. The fourth and last member to be met on this tour is again very common in Creole gardens of Reunion Island and very much enjoyed, originating from South America. It is a fast-growing one which also blooms pretty much year around and even when the flowers themselves have wilted the colorful bracts stay on, many people actually think that those are flowers, a common mistake just like with the bougainvillea. Pachystachys lutea (one of the 12 or so species of the Pachystachys genus) sometimes known under the synonym of Justicia lutea is commonly called ‘yellow candles' (on Reunion it will be ‘chandelle' but also ‘panache d'officier') referring to its particular erect inflorescences or spikes. Those are made of bright yellow bracts out of which the quite inconspicuous white flowers will emerge, they will soon fall (after the greedy visit of hummingbirds in their homeland) but as stated before the yellow spikes will remain for quite a long time. As it grows up to four or five feet it can be used to hide some unaesthetic parts of the garden as well as pruned into small hedges. It will do always better in full sun and although not fussy regarding soil conditions can be victim of strong iron chlorosis (a deficiency in iron fixing which produces pale leaves because of the lack of chlorophyll). As you now are aware of, this botanical family hosts some very different plants and though some may already be familiar with the keen gardener we will undoubtedly get acquainted later with some lesser known species.